Canadian Pacific Railway Ltd. announced Wednesday that its current chief operating officer, Keith Creel, will become president and CEO on July 1 next year, taking over the reins from Hunter Harrison. 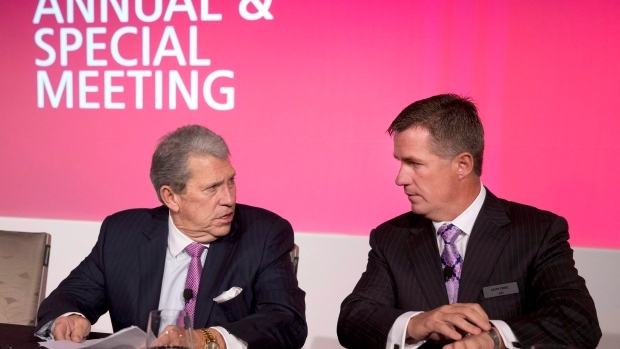 CP Rail also said Harrison, who joined the railroad as CEO in June 2012, will remain with the company as a consultant for three years during his retirement. Creel was appointed president and COO in February 2013, and was previously executive vice president and COO of rival Canadian National Railway. Harrison’s last attempt at retirement didn’t last long. He stepped down as CEO of CN Rail in 2009; a few years later, he became a major figure in Bill Ackman’s activist campaign to oust CP’s management. Harrison was appointed CEO of CP on June 29, 2012. Since then, he’s improved the railway’s operating ratio (an important measurement of efficiency) – and shareholders have been rewarded in the process: CP’s stock closed on Tuesday 153 per cent above where it was trading when Harrison was appointed. "I've demonstrated my trouble with retiring in the past, so being available to the board and the organization after my official retirement is exciting," Harrison said in a statement. The announcement came hours after CP issued a separate statement saying that one of its board of directors has resigned, days after he lost an appeal of gross negligence penalties for not reporting $18.85 million of taxable income from dividends. Canadian Pacific says Anthony Melman, who also served as the chairman of its finance committee, has stepped down to assess the impact of the Tax Court of Canada decision earlier this month. Judge Randall Babcock ruled that Melman had been "wilfully blind" to his accountants' omission of the income in his 2007 tax return. Melman joined the CP board in 2012 and has also been a member of its audit committee. He is a former managing director of Onex Corp. and a former senior vice-president of CIBC, according to documents filed with regulators. CP Rail also reported a 16 per cent decline in quarterly profit on Wednesday, hurt by weak commodity volumes, the Fort McMurray wildfire in northern Alberta and a stronger Canadian dollar. Canada's No. 2 railroad said its net income slipped to $328 million, or $2.15 per share, in the three months ended June 30, from $390 million, or $2.36 per share, a year earlier. "Revenue challenges in the second quarter, as noted in our quarterly outlook release last month, included lower-than-anticipated bulk volumes, devastating wildfires in northern Alberta and a strengthening Canadian dollar," Harrison said in a statement.